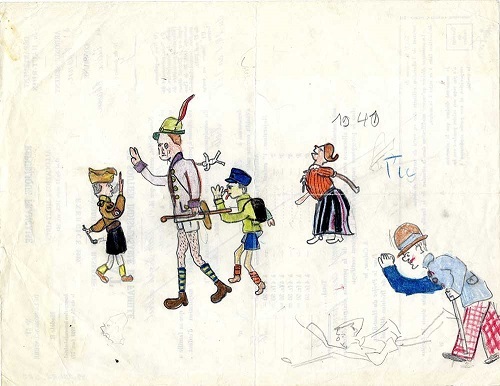 This week we talked to Lucy Stone, a PhD student at Newcastle University, UK, who is studying the childhood drawings of children’s authors and illustrators who were children in exile in the Nazi era. Her fascinating research focuses on the drawings of Tomi Ungerer and Judith Kerr, the author and illustrator of the Out of the Hitler Time trilogy (1971-1978), The Tiger Who Came to Tea (1968), and the Mog series (1970 – 2015). Stone spoke about the significance of these authors’ childhood drawings in the context of the Hitler years, and the insights they give us into a child’s unique view of exile and war. When viewed as formative pieces of these artists’ work, they can help us understand the art they made as adults. And when looked at as historical documents, these drawings can help us understand how exile and war affects children emotionally. One of the drawings Kerr made in Berlin before the family’s forced migration from the city. © Judith Kerr. Photo courtesy of Seven Stories, the National Centre for Children’s Books. Stone set out to see if there were anymore of Tomi’s childhood drawings that hadn’t been published in his memoir. It was then that she connected with the Musée Tomi Ungerer in Strasbourg. “It was incredibly good timing, they were beginning to prepare the exhibition of Tomi’s drawings from his childhood and youth, and Thérèse Willer, the museum curator, invited me there as they were pulling them out of the workroom and making a selection to include from the hundreds of his drawings and paintings made on loose sheets of paper, and in sketchbooks, diaries and school copybooks. I was able to talk through these drawings with Thérèse, and learn a lot about how Tomi developed his craft as a boy; the influences of his childhood reading, his experience of the Nazi occupation and the complexity of the Alsatian identity. I’m very grateful to Thérèse and her team, but also to Tomi’s mother, who, like Judith’s, kept hold of her youngest child’s drawings.” Alice, Tomi Ungerer’s mother, never threw anything that he made away. His expansive archive, (now spanning several countries! 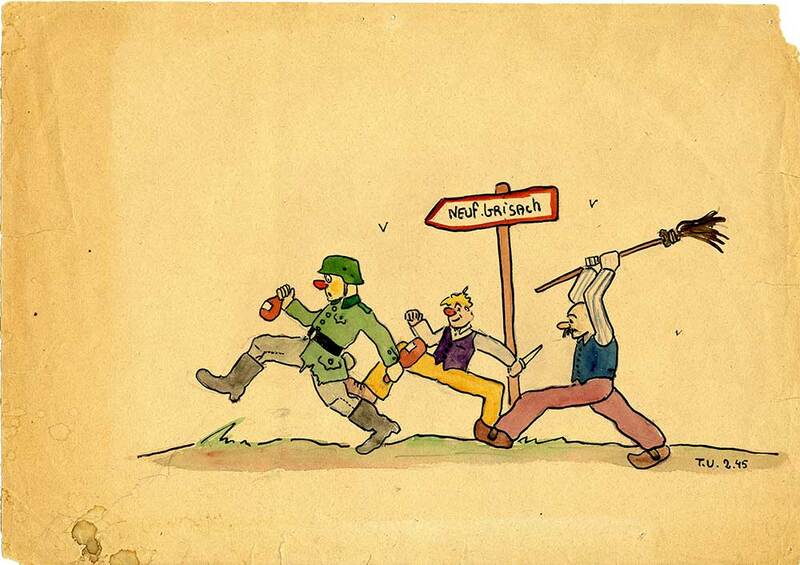 ), includes piles of drawings from his childhood and youth in Alsace. Though the two artists’ experiences differed, Stone has noticed recurring motifs in their drawings. Trains appearas symbols of the movement and unsettlement that exile and war bring. “The train marks the starting point for war and exile for them. 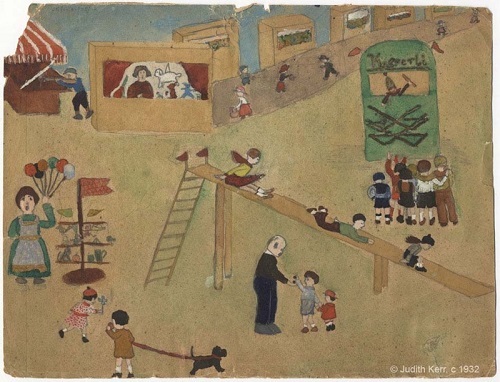 Judith’s family fled Germany by train, and this became a significant object in her work. 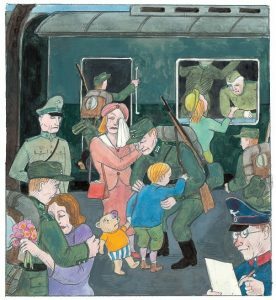 And the picture of Tomi’s that stands out most to me is the one he drew of the Wehrmacht arriving, driving in from the East on motorcycles and in cars, and, in parallel, a steaming train; together a machine of war entering into Alsace and into Tomi’s life”. Tomi Ungerer’s Chidhood Drawing, © Tomi Ungerer, Musée Tomi Ungerer collection. 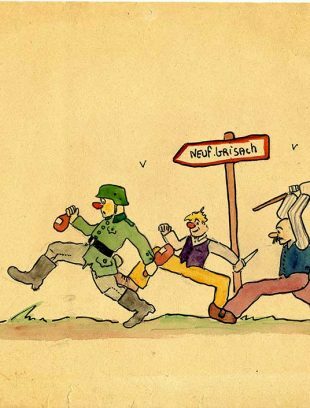 The imagery of his childhood under occupation has seeped through into Ungerer’s books, especially in Otto, which is the one that most directly tackles the Second World War. Stone’s view of trains as a symbol of exile can be seen in the scene where Oskar’s father says a tearful goodbye to his family as he heads off on the train to fight in the German army. Stone’s project also argues for the significance of children’s drawings as historical sources. “Exile and war – both children and adults are forced to endure them, but in the fields of exile studies, history and children’s literature, too, there is some distrust of the writings, drawings, etc., that children craft. The French historian Manon Pignot is one scholar at the moment doing a lot of work to advocate children’s drawings as valuable historical documents which show children as victims, witnesses and social actors in war”. 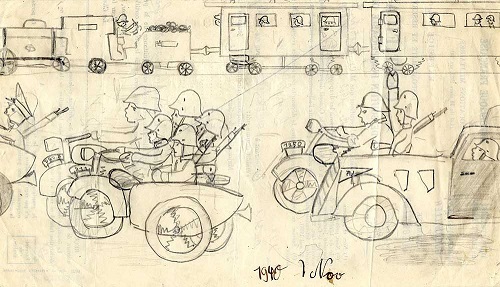 Last year Pignon was part of a team in France that curated an exhibition of children’s wartime drawings from the twentieth and twenty-first centuries that included a drawing by Tomi, under the theme of “captivity”. “What this exhibition made quite clear is that while each child’s experience of occupation, conflict and/or exile is individual, there are certain themes that occur and recur in each war, and certain traits that reveal children’s emotional responses to these horrific happenings,” Stone explains. “What this exhibition could not do, however, was find out what happened to these child war artists. So many, of course, sadly, did not survive. But of those who did – how did they ‘grow up’ after having to live through such ‘adult’ experiences at a young age? This is one question I’m trying to answer in my research. While I can only look at the specific cases of Tomi and Judith as child artists who became children’s illustrators and authors, I hope that these cases will contribute to the conversation on children’s war drawings and how invaluable drawing for children is. Not only as a means of documenting potentially traumatic experiences as children, but in their later, adult lives, to fill in the gaps of their childhood knowledge of the Third Reich, Holocaust and Second World War. To craft narratives which can be transmitted to current and future generations of children, and offer them insights into what it means to be a child in exile and/or war”. As an adult author, Tomi Ungerer wrote about his childhood experiences in Tomi: A Childhood Under the Nazis. In the book’s introduction he is quick to say that his memoir is only one perspective, from the relatively lucky standpoint of an observer. He refers to the “spectacle” of war when it’s viewed from a child’s perspective. Stone finds this a very interesting passage: “I wouldn’t say Tomi’s war drawings show a detachment, but rather a child very much caught up in both playing and fearing war. I would say Tomi’s sense of detachment has come with time; as an adult he has been able to take a step back and ‘curate’ his childhood drawings and position them as part of a much larger historical and political canvas”. As an adult, much of Ungerer’s work in children’s books has been an effort to educate children about prejudice, so that future generations can go into life with more awareness. “Childhood, and childhood reading, do not come to a sudden standstill, but (as Kimberley Reynolds has noted) ‘continue to unfold and inform how we interpret the world’”, Stone says. And when childhood is disrupted by something like war, it can take a lifetime of work to process. Ungerer himself has said that what drove him to children’s literature was a desire “to conceive tales that I myself would have liked as a child. The child in me, call it arrested development, has been present, lingering throughout my career”. Much of his work is now an effort to educate children about prejudice, so that the next generation can go into life with more awareness. 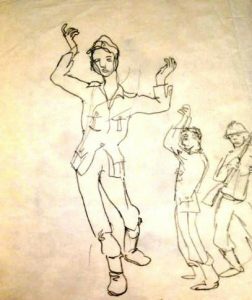 Studying children’s drawings can offer us a chance to look at war through an unfiltered lens, from the perspective of those it affects most. And by bringing these drawings to light, researchers like Lucy Stone can only hope that it will help in some small way to ensure future generations of children will have the chance to create and draw away from the horrors of conflict. With thanks to Lucy Stone, Judith Kerr, Philippa Perry, Sarah Lawrance, Kimberley Reynolds and Beate Müller. Lucy Stone’s doctoral research is funded by the Research Excellence Academy. * “Children’s Drawings, Adults’ Wars” is a translation of Déflagrations: dessins d’enfants, guerres d’adultes, the Eurométropole, France 2017 exhibition of children’s war drawings held at the Médiathèques de Strasbourg. See also: Read our article about how Tomi’s childhood under occupation influenced some of his most popular books, here. See more of Tomi’s childhood drawings here. Childhood drawing, ©Tomi Ungerer, Musée Tomi Ungerer collection.